Signed by the civilian employee Teichmann and countersigned by Bischoff. Received by the DAW on 15th February 1943. Although the word “Türen / doors” is hardly suitable for openings of 30 by 40 cm, more the size of small windows, it was nevertheless used 4 times before the civilian workers of Riedel & Sohn, who had to fit some of them in the gas chambers of Krematorium IV, began to call them more correctly “gas-tight windows”. Each of the Krematorien had 6 such windows, while their gas chambers had 7 Zyklon-B introduction openings to be fitted. This discrepancy can be explained now (see point 22). It is apparent from the three windows remaining after the dismantling of Krematorium IV and the destruction of Krematorium V, that two types of “gasdichte Fenster” were made. The first, made in accordance with the order of 13th February 1943, required TWO operations for opening or closing, while the second required only ONE. 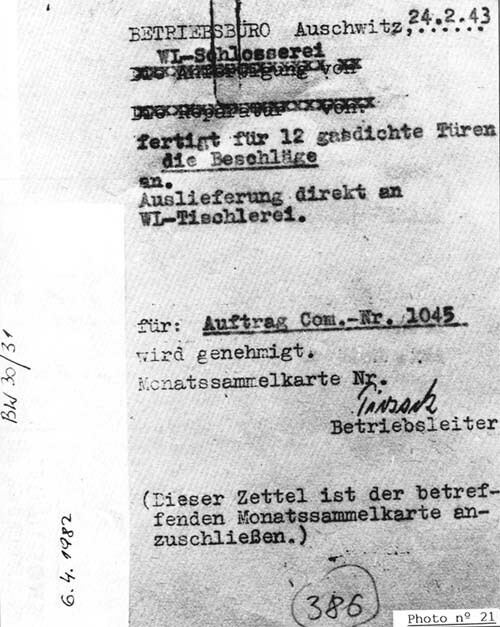 This order is the first link in a chronological chain proving the existence of gas chambers in Krematorium IV, their rooms on the west side being fitted with gas-tight doors and windows. The 12 “doors” were delivered on 26th February 1943. Filled in by the DAW administrative office, this note covered the transfer of the door fillings completed by the metalworking shop to the woodworking shop where the doors where made and assembled.